A calming sea-view villa with infinity pool and Jacuzzi just a short walk from a gorgeous beach. Gazing out to sea from amongst its olive trees, Epipleon combines just about everything that is desirable about a holiday home: flexible space, bright, calming interiors, relaxing gardens, a dreamy al fresco dining area and that most delicious of watery trilemmas: to spend more time swimming in the sea, floating in the infinity pool, or wallowing in the Jacuzzi. Inside: accommodation at Epipleon is spread over three houses just a few steps from each other. The central main house is an open-concept communal space comprising a kitchen-diner opening out onto an al fresco dining area, and, down a few steps, a comfy sea-view living area looking out over and accessing the pool and Jacuzzi. A shower room completes the accommodation of the main house. The second and third houses, one on either side of the main house are, in effect, independent bedroom suites. The master bedroom suite one hosts a double bedroom with en-suite shower room, a small sitting area, a kitchenette and a mezzanine level with twin beds, suitable for children. The other has a double bedroom with en-suite shower room, a single children's bedroom on an open mezzanine level, and a private terrace outside. Both suites have sea views and access to the decked terraces. Furnishings, fittings and decoration at Epipleon create a light, airy atmosphere that inspires relaxation and repose. Outside: Epipleon is hidden away in a garden of whispering olive groves overlooking the irresistible blue waters of the Ionian Sea. All the property's outdoor areas are oriented towards this view, so no matter where you are outside, whether you're dining, lounging, floating in the infinity pool or bubbling in the Jacuzzi, gorgeous vistas abound. Decking runs along the front of the property, connecting the three houses, the pool area and panoramic sitting areas, bringing guests together for convivial dinners under the stars while at the same time leading to peaceful spots for an afternoon hammock-nap under the shade of an olive tree. For al fresco dining, guests may choose between a shaded area just outside the kitchen or an area below the pool equipped with barbecue and sink. Epipleon has excellent eco-credentials: solar panels to heat your water, a salt filtration system for the swimming pool, eco-insulation and triple glazing all ensure that the C02 emissions from this house are kept to a minimum. Please note that the sleeping areas on the mezzanine levels are open to the bedrooms below. As such, and bearing in mind their lower ceilings, they are most suitable for children. Epipleon features a fantastic infinity pool, offering swimmers stunning views while in the pool. There is a drop from the infinity edge so we recommend children are supervised at all times. Please refer to our general safety page if you would like more information about infinity pools. There are also some drops around the grounds so we recommend that younger children are supervised by an adult when exploring the property. Epipleon lies in the northwest of Lefkada, just two kilometres outside the little village of Tsoukalades, which is home to a couple of shops and a few tavernas. A short stroll below the house is a gorgeous sandy-pebbly beach. A 15-minute drive away is the capital, Lefkada Town, which has a great buzz in the summer, thanks to its host of restaurants, bars and shops and its marina. A short drive south will take you to the azure waters and sandy beaches of Pefkouli, Agios Nikitas, Milos and Kathisma. Inland from Epipleon there is some excellent walking, with mountains rising to over 1,100m, some truly beautiful scenery, and a scattering of unspoilt villages where the way of life remains profoundly connected to the island's ancient traditions and customs. Lefkada measures 35km from its northern tip to the dramatic white cliffs of Cape Lefkatas in the south and just 15km from east to west. This being the case, it is relatively easy to explore in a week (if you can pull yourselves away from the views and pool of the villa!). At its northern point the island is connected to mainland Greece by a floating bridge and, via frequent ferry services from the ports of Nidri and Vasiliki, to several of the other islands of the Ionian archipelago (including nearby Meganissi), making it eminently possible to travel further afield. "Epipleon was brilliant and the owner was really really impressive - top marks. We had a great holiday." Epipleon was delightful and in a magical setting. We particularly enjoyed the combination of a lively small town (Lefkas) with a beautiful, peaceful villa. 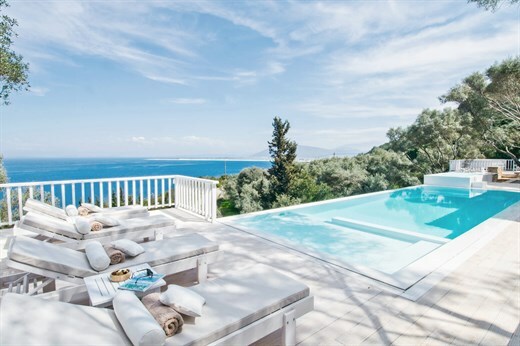 This year was our second stay at Epipleon and the villa was just like I remembered it and even better as the owner had added new outdoor living spaces. Thank you for a great holiday at Epipleon and all your support in organising it. The owner was absolutely fantastic and couldn't have been nicer or more helpful. The fantastically helpful owner has clearly taken the greatest care to make the most of all the outside spaces, so there was a huge choice of calming and comfortable facilities in which to relax!! The purity and quality of the pool was a highlight, as was the constant availability of hot water in spacious shower rooms following each swim!! The word which most comes to mind when summarizing our experience of Epipleon overall is 'serene'. Epipleon was brilliant and the owner was really really impressive - top marks. We had a great holiday. We had a fantastic holiday at Epipleon with the owner ensuring that our stay was as comfortable as possible. If anything the photographs did not do Epipleon justice. We have stayed in many luxury villas over the years but none has been better than this. Nothing has been left to chance. Every detail of the design is beautiful and practical. It is very well designed and really comfortable. It is a secret, ten minute, magical walk from Epipleon to a tiny cove. Not even stressful uphill on the way back The owner was enormously friendly and helpful. Owners went over and beyond for our stay - providing us with toys etc for our baby and even installing blackout blinds - very nice and welcoming! The owner was incredibly helpful; huge thanks for his kindness and making us feel welcome in his villa. He couldn't have been better. Ein wunderschönes Haus! Um hier etwas negatives zu finden muss man schon ganz tief in die Details gehen um Kleinigkeiten zu finden. Absolute 5 Sterne! Ich hoffe dass der (großartige!) Besitzer es schafft die Villa über die Jahre in gutem Zustand zu halten, da der Pflegeaufwand aufgrund der Bauweise bestimmt sehr hoch ist. Wir freuen uns diese Perle entdeckt zu haben und kommen gerne wieder! Vue magnifique, propriétaire disponible et au petit soin, vraiment parfait, tout fois.